Location: 20 metres north-east of the gate between Grassington Moor and Conistone Moor. Located just inside the Conistone liberty, this is a large, flat, uncut boulder inscribed on top. 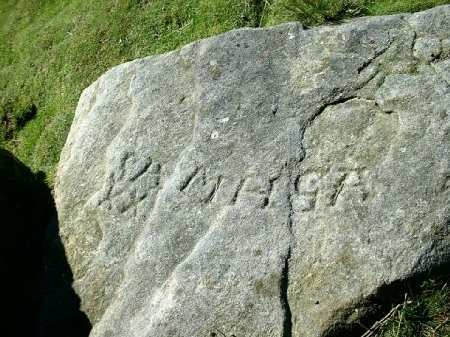 It could be a stone associated with the Grassington Moor veins which extend into the Conistone liberty, but is more likely to be the initials of bored-wallers who worked on the Grassington-Consistone boundary wall. Note: this stone has now been lost as a result of track building.Photograph courtesy of Gordon Booth.